Ionizing radiation is radiation with enough kinetic energy so that during an interaction with an atom, it can remove tightly bound electrons from the orbit of an atom, causing the atom to become charged or ionized. Such an event can alter chemical bonds and produce ions, that are especially chemically reactive. This greatly magnifies the chemical and biological damage per unit energy of radiation because chemical bonds will be broken in this process. Depending on the level of exposure, radiation can pose a health risk. It can adversely affect individuals directly exposed as well as their descendants. Radiation can affect cells of the body, increasing the risk of cancer or harmful genetic mutations that can be passed on to future generations. If the dosage is large enough to cause massive tissue damage, it may lead to death within a few weeks of exposure. Radiation protection, sometimes known as radiological protection, is the science and practice of protecting people and the environment from the harmful effects of ionizing radiation. Ionizing radiation is widely used in medicine and industry and can present a significant health hazard. It causes microscopic damage to living tissue, which can result in skin burns and radiation sickness at high exposure, and statistically elevates risk of cancer at low exposure. 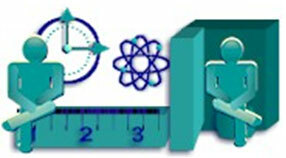 The objectives of radiation protection are to minimize the health effects due to radiation. Before formulating the appropriate countermeasures, we have to understand the biological effects of ionizing radiation. Biological effects of radiation are mainly classified into “Deterministic Effect” and “Stochastic Effect”. For the former, a threshold value of absorbed dose exists, above which the radiation will bring detrimental effect to the health such as cataracts, skin erythema and sterility. For stochastic effect, a threshold does not exist, but the probability of having detrimental effect is proportional to the dose absorbed, such as cancer and genetic effect. Individual dose limits – the exposure of individuals will be subjected to dose limits to ensure that no individual is exposed to radiation risks that are judged to be unacceptable. 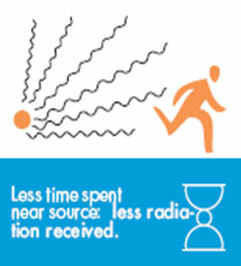 The amount of radiation exposure increases and decreases with the time people or workers spend near the source of radiation. Reducing the time of an exposure reduces the dose proportionally. 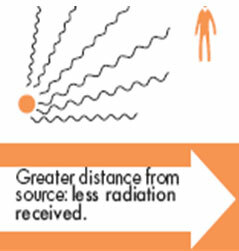 If the time spent in a given radiation field is doubled, the worker’s dose is doubled. Therefore, to limit radiation dose, the time spent in the field must be limited. An example of reducing radiation dose by reducing the time of exposure might be improving operator training to reduce the time they take to handle a radiation source. The radiation dose received from a source is inversely proportional to the square of the distance of separation. As a rule, if you double the distance, you reduce the exposure by a factor of four. Distance can be as simple as handling a source with forceps rather than fingers. 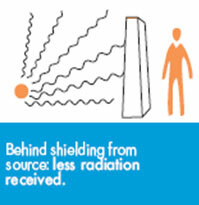 The greater the shielding around a radiation source, the smaller the exposure. Shielding simply means having something that will absorb radiation between you and the source of the radiation. The radiation that manages to get through falls exponentially with the thickness of the shield. The amount of shielding required to protect is dependent on the different types of radiation and energy.
? 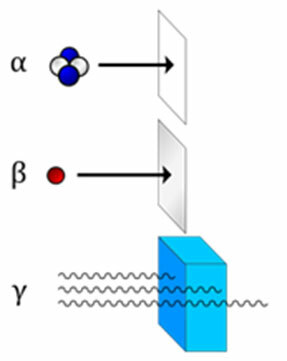 (Alpha) : A thin piece of light material, such as paper, or even the dead cells in the outer layer of human skin provides adequate shielding because alpha particles cannot penetrate it.
? (Gamma): Thick, dense shielding, such as lead, is necessary to protect against gamma rays. The higher is the energy of the gamma ray, the thicker is the lead needed. X-rays pose a similar challenge, so radiographers often give patients receiving medical or dental X-rays a lead apron to cover other parts of their body. Protection and safety should be ensured by sound management and good engineering, quality assurance, training and qualification of personnel, comprehensive safety assessment and attention to lessons learned from experience and research. The goal of radiation protection is to limit human exposure to ionizing radiation to a degree that is reasonable and acceptable in relation to the benefit gained from the activities that involved the exposure, thereby reducing the likelihood of occurrence of somatic and genetic effects. In medical application exposure to ionizing radiation carries with it both a benefit and a risk. The benefit of information from an x-ray examination regarding the clinical management of the patient is weighed against the small, but nonetheless finite, risk when a physician requests the examination. 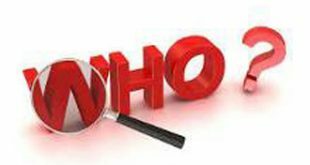 The information on the clinical condition of a patient derived by the physician from a radiologic examination is an essential part of the practice of modern medicine. It is the responsibility of the radiographer to ensure that each patient received the minimal dose of radiation that will produce a diagnostic image consistent with the requirement of the examination. Radiographers must also ensure that all individuals are properly protected from unnecessary radiation exposure.